In Hawaiʻi’s prior subsistence society, the family farming scale was far different from today’s commercial-purpose agriculture. In ancient time, when families farmed for themselves they observed and adapted; products were produced based on need and season. ʻIkuwa (October-November)—“Loud voice”: This is the time of thunder in the uplands, wind in the lowlands, and crashing surf along shore. The season of storm and rain was termed Hoʻoilo, including roughly the period of November through March. It commenced with ʻIkuwa, when Lono’s thunder resounds over uplands and plain. November is a noisy month with variable strong winds; and with the wind comes the roaring and pounding surf on Kāʻu’s lava-walled shores and small steep beaches. Welehu (November-December)—The “ashes” (lehu) of fires for cooking and warmth, as the wind swirls about the eating and work areas. About this time, and continuing through the rainy months until March, there was and is little deep-sea fishing, and inshore fishing depended on those occasions when the sea was not too rough. Equally, upland work, such as cutting timber, stripping bark for cloth and for fiber, collecting wild foods and hunting birds, was gradually abandoned because of the rains. It was a time of being inside the respective homesteads: a time for work that could be done under a roof and out of the wind. Makaliʻi (December-January)—The “little eyes” (makaliʻi) or shoots of yams, arrowroot, turmeric, looking like points or eyes (maka) are showing. Kaʻelo (January-February)—The (ka) drenching (elo) time, as the rainy season and southerly winds culminate and subside, as northerly winds push in. This is the month when migrating birds are fat and greasy (eloelo). Kaulua (February-March)—“Two together” (ka (the) lua (double)), i.e., partly cold and partly warm: alternating cool and warm spells. 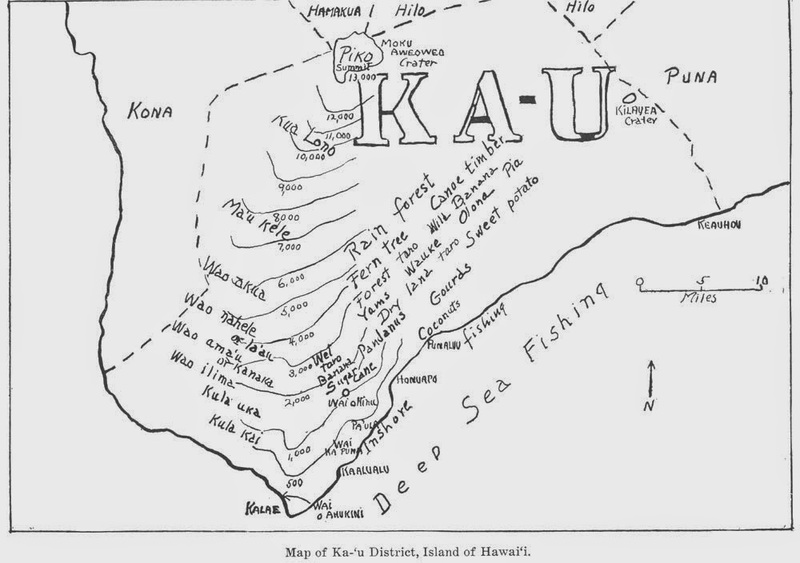 Kaulua also means “of two minds,” “indecisive”: the weather is “undecided,” so people are uncertain whether to go mauka or makai, go out or stay in. Nana (March-April)—The word means “animation.” Life in plants shows vigor, young mother birds (kinana) are on the move, fledglings (pupua) are trying to get out of nests. Welo (April-May)—“Vining out” (like a tail, welo): The sweet potatoes, yams, morning glory and other vines are spreading with little shoots, like tails. During April, gardens are tended; by May plants both domesticated and wild are growing vigorously, and in May quick-growing varieties of sweet potatoes can be eaten, and wild yams and arrowroot are coming to maturity and can also be eaten. They come into their prime in late-May and June. Ikiʻiki (May-June)—“Warm and sticky,” uncomfortable: Now there is little wind and it is humid. This moves into the early hot season (Kau.) This is the time when women are working at making bark cloth (kapa) at home. Men are actively hunting in the forest, fishing at sea, busy with their nets, canoes and gear at the hālau (shed) by the sea. By June, wild foods are abundant in the forest, potatoes plentiful. Inland women-folk migrate to the shore, and there live in caves and shelters. With their fishing baskets (hinaʻi), salt and fish baskets, mats and utensils, they catch small fish like manini spawn, collect and store salt that has dried in the pools in black lava depressions by the shore. Kaʻaona (June-July)—“Pleasantly (ona) rolling along (kaʻa).” The serenely moving puffy clouds (kaʻalewalewa) roll along mountain and horizon. Ona means lure in fishing: figuratively, then, attractive, alluring. In July, gourds (and, after introduction, melons) ripen on the kula kai. It is increasingly hot and dry. Upland farmers have mulched their taro and potato patches with dried grass and fern. August is hot, but some dark clouds appear and bring showers; as they fall, the mulch is turned back from plants, then replaced when the rain has soaked in. At the shore in caves, and at home, salt and dried fish and octopus are stored in quantity. Then come the twin months, September-October, Mahoe-mua (Twin-before) and Mahoe-hope (Twin-behind, or after), with increasing showers and rough seas alternating with fine weather. The wild ground growths in the uplands are dying down; it is time to harvest potatoes before the heavy rains come. These two months, in weather, are as alike as twins. Rains and wind alternate with good weather. This is the cycle – to be repeated, year after year. 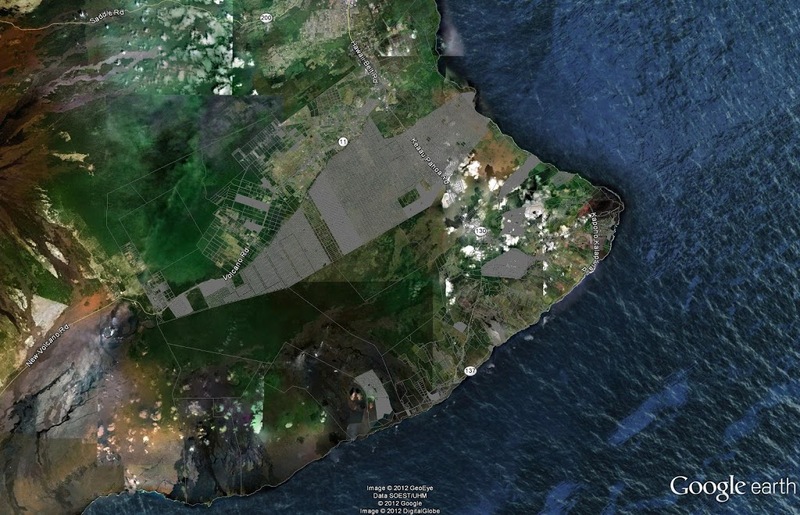 The image shows the district of Kāʻu on the Island of Hawaiʻi.